Fires are classified based on the type of substances that fuel them. Because of this, you cannot treat all fires the same way. 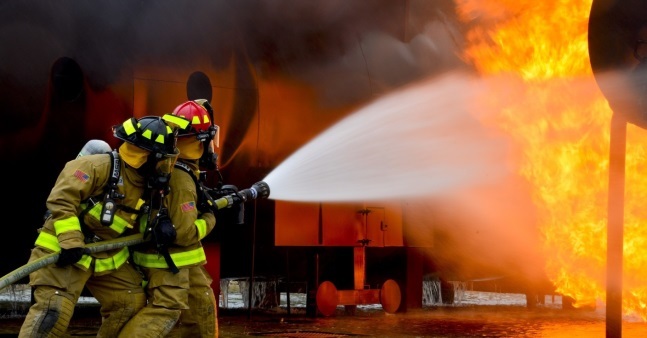 If you are a business owner, you may be more susceptible to a larger variety of fires depending on the type of equipment that is used on your property. Class A fires are caused by ordinary objects that are combustible like wood, paper, cloth, etc. The materials found in your average fire extinguishers are typically enough to extinguish Class A fires. Class B fires include flammable liquids and/or gases which typically include gasoline or propane. A common way to extinguish these fires is to smother them to completely remove oxygen. Class C fires are commonly known as electrical fires. These fires can come from motors or computers. If possible, turn off the power source and use a non-conductive chemical to extinguish the fire. Class D fires are produced by combustible metals like titanium or aluminum. Common extinguishing agents like water do not work on Class D fires, so you should use a dry powder agent. Class K fires are caused by cooking materials like grease, cooking oils and fats. Turn off your kitchen appliances and use your Class K rated wet chemical fire extinguisher. This type of extinguisher is required for all commercial kitchens. Keep your business safe by remembering the five different classes of fires and what extinguishes them. If you have had fire damage to your home or business, visit DKIServices.com to find a DKI fire damage repair team near you.